I was fortunate enough to receive a package from Carrington Farms a company I have never heard of before but man I know who they are now. 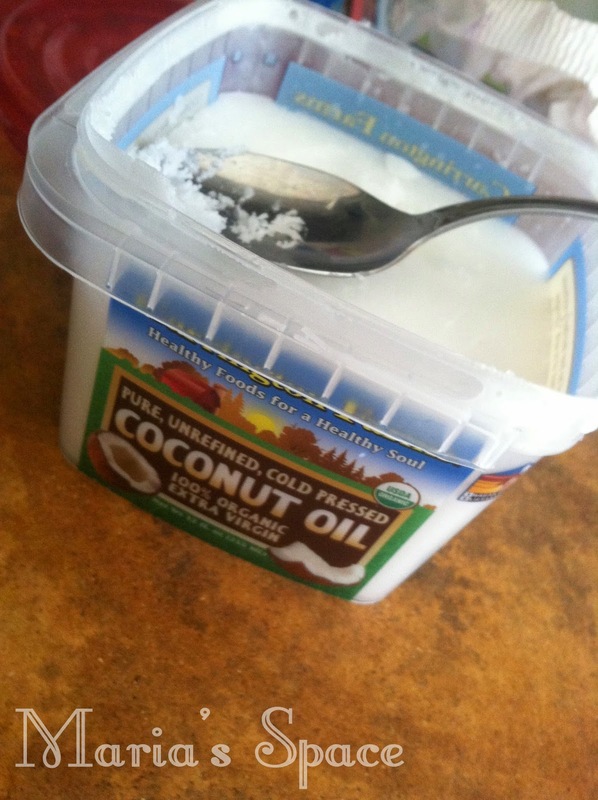 Coconut oil is something I have been meaning to try. It is everywhere these days. They sent us the pure, cold pressed coconut oil which smells divine. I have used it for many things so far but the best part has been for the lipsticks my daughter has become obsessed about making. It is pretty cool! You basically boil some water. 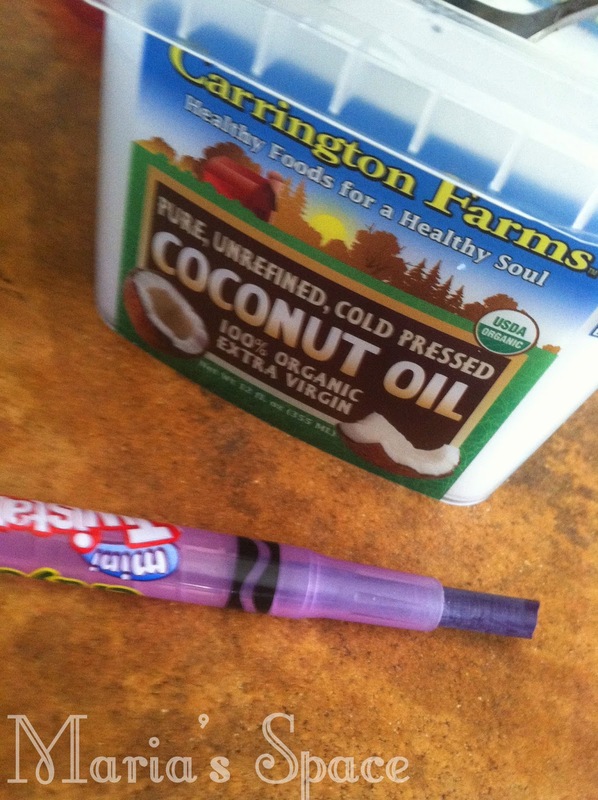 In a little glass or in our case plastic bowl you melt the crayon with the coconut oil and wa-lah! Instant lipstick my daughter is allowed to wear. We mixed, mixed and mixed some more until it was smooth. Next we poured it into a bead container I never got around to using and let it set. 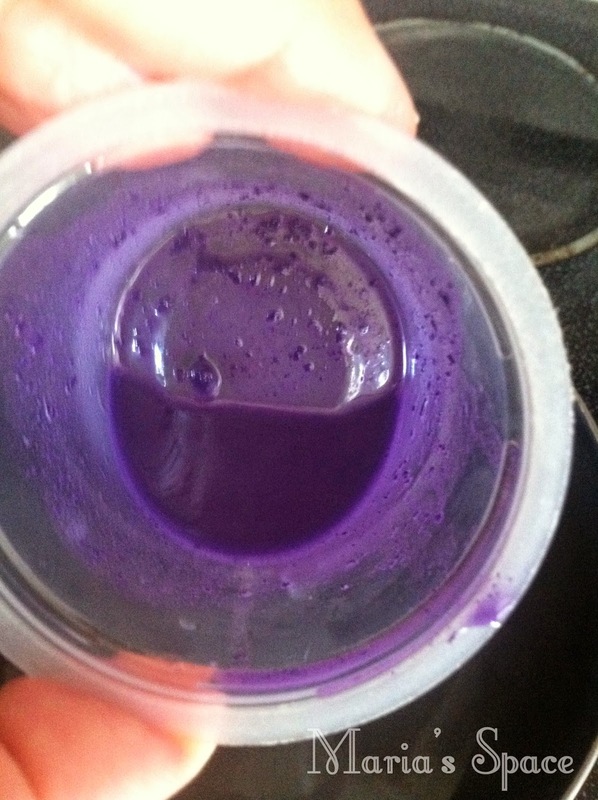 I swear it is purple although it looks blue in this photo. She just uses the tip of her finger or a lip brush to apply. We need more crayons. Our absolute favorite Carrington Farm product is Milled Flax Seeds. Goddess and I are addicted to Flax seeds and eat them as is. We usually have them in seed form. These milled seeds were opened right after the box with all three products was opened. 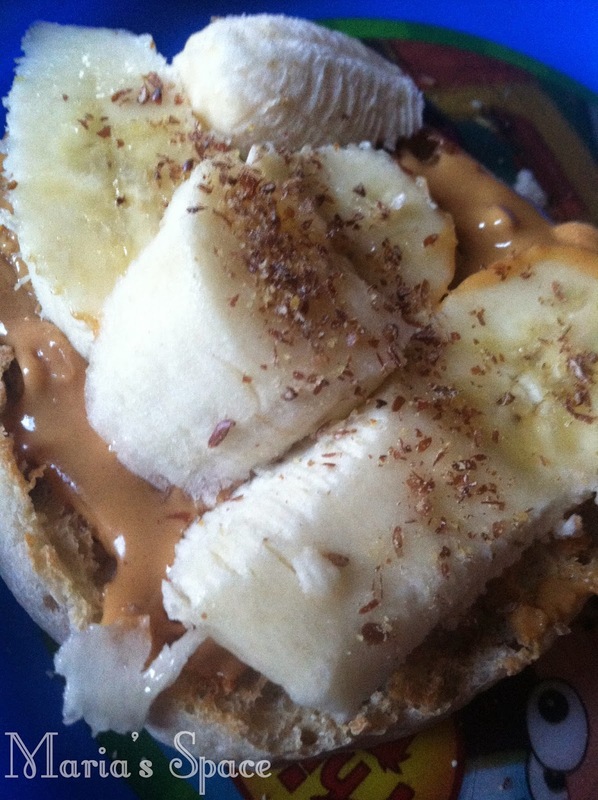 We put them on everything from yogurt, to oatmeal, salad, and even my gym breakfast an English muffin with peanut butter and half a banana. Goddess just sticks a spoon in the bag. We also found out that Flax is rich in vitamin and minerals. Also that it is a great low carb, gluten-free seed and is helpful for digestion. We just knew it taste good. While I don't have a photo of it, I have used the Coconut Cooking Oil on everything from french fries, meatballs, eggs, pork cutlets and more. There is no coconut flavor to it so it doesn't change the taste of the food but what I did notice is that it doesn't burn out the way other oils do. It doesn't smoke either. All great things. 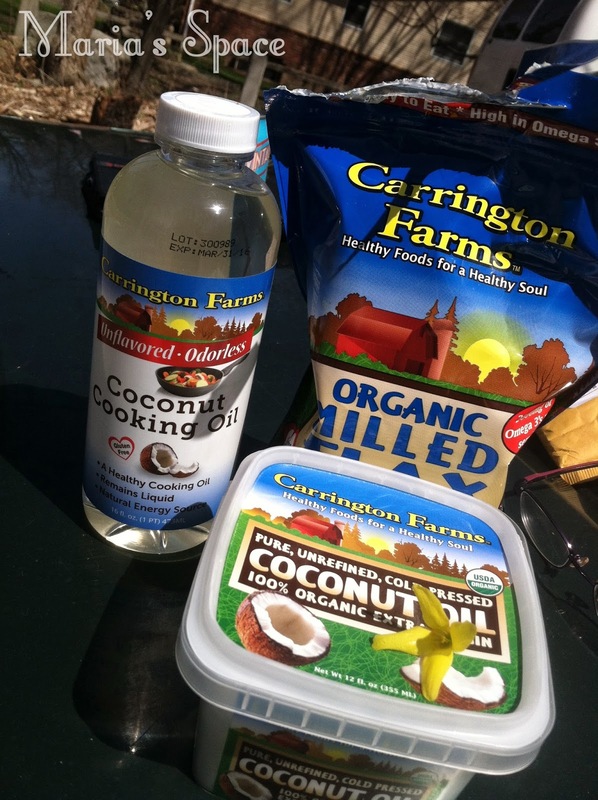 I recently read on the Carrington Farms website that coconut oil is great for hair too. I have dry hair and hope to use it this weekend. Head over to the Carrington Farms site and see what other products they have and why they are so good for you. We will certainly be buying them in the future. Disclaimer: We received a box of samples for our honest opinions. No monetary compensation was received. I have never heard of this company either. I'd love to try their flax seeds and their chia seeds. 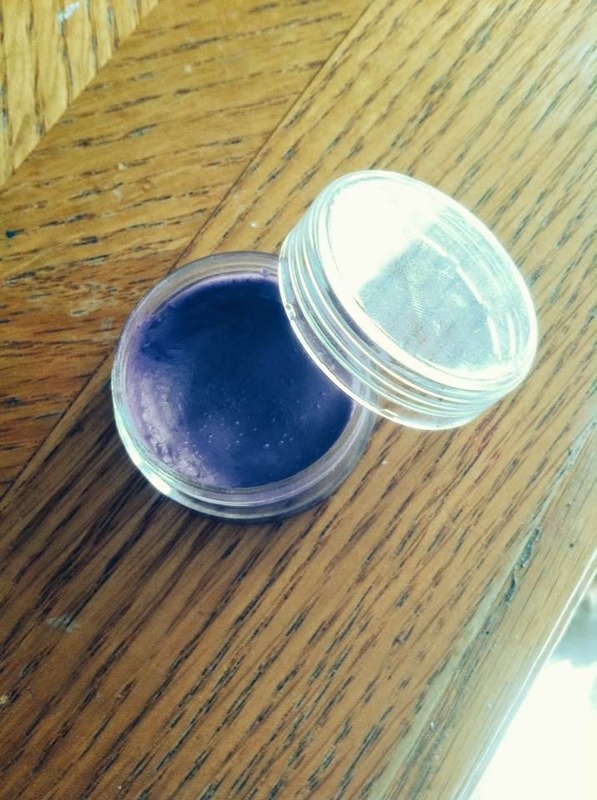 Very interesting recipe for lip gloss! Will have to try that one with my girls! I love coconut oil too!! My husband tried the hair idea and left it on for an hour. He liked it! He is cooking with it too!! I like the lipgloss idea. Fun and useful and smells nice I bet! Flaxseeds are good for you!! I will have to get some at the store. Very healthy!! Thanks for the info on Carrington Farms. I haven't heard of them before.